Thank you, Mark. Agreed and well said. This entry was posted in Indie Authors, Publishing and tagged authors, books, Brian Marggraf, fiction, independent publishing, indie author manifesto, indie authors, indie hero, literature, Mark Coker, non-fiction, poetry, publishing, reading, self publishing, Smashwords, writing. Bookmark the permalink. I absolutely love this! I want to get a book of my poetry published but I’m not sure how to go about this. I noticed that you started following me and was wondering if you had any advice for a first time publisher. A few samples of my poetry along with my photography are in my posts. I greatly appreciate any help! Thanks in advance. Isn’t this great? 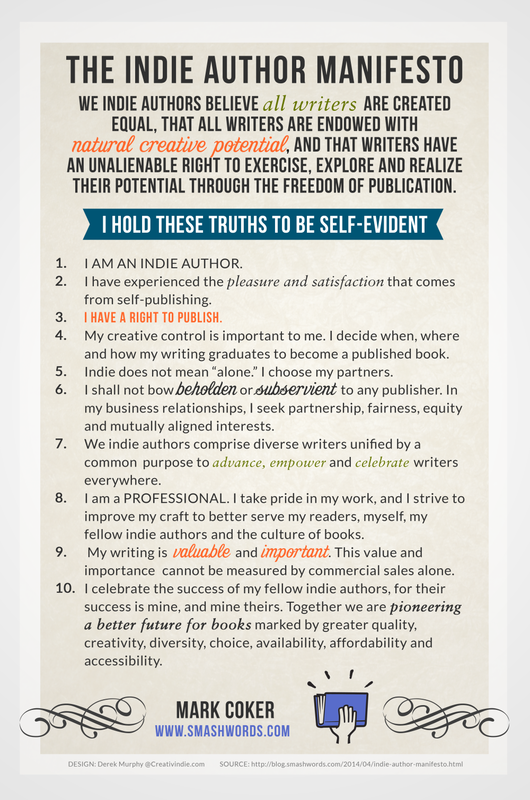 One doesn’t need to be an aspiring or accomplished author to appreciate how empowering the Indie Author manifesto can be. In the same way that positive psychology goes beyond just ‘norming’ people and aims to enrich them, the Indie Author manifesto shows how the internet can empower everyone to create, share and produce, rather than just consume. Very well said! I couldn’t agree more. Thanks so much for following my blog! I’ll be coming back for a closer look! Just reblogged this. Thanks for posting. Man…that’s powerful. I would never have thought of some of these, but I can see the need for real. Yes, you have found my blog and are following it, this is good, you have so many followers I expect I will be lost, But thank you, I look forward to following with pleasure: Pat – just planning my first indie – with illustrations. I’m not sure I can agree with this list… I’ve always looked forward to the day when a portly, balding man would sit behind his comfy desk and decide the fate of all my stories. I like numbers 3 and 9 most. Thanks for sharing this! I couldn’t agree more that all writers are created equal. There is a beauty in writing for the sake of sharing a truth of oneself and the freedom that isn’t shackled by any other motive. Fearless. Fierce. Collaborative. Creative. Thanks! Anyone who stops waiting around to be told to dance to the turn of someone else – and who lifts up their proverbial pen and sticks it in the eyes of the snobs, the market brainwashed and the ‘I’ll scratch your back if …’ brigade is an indie writing hero in my book. Sending you greetings from Merry England and the Robin Hood Indie Crew! Thanks for finding me. Ace stuff. Well, aspiring and well-connected authors could always follow the route of Peter Matthiesen, who started off in somewhat dubious circumstances, shall we say. That’s a different kind of model than this. Good luck. Reblogged this on The Vanity Enabler. I LOVE this! Please share. I think every Indie author and every reader should know this manifesto. I’m proud to be Indie!